With roots dating back to 1881, Woodbine Entertainment is the largest horse racing operator in Canada, showcasing world-renowned horse racing at Woodbine Racetrack (Toronto), home of the iconic Queen’s Plate as well as Woodbine, Mohawk Park (Milton), home of the Pepsi North America Cup. The leadership team at Woodbine Entertainment has long envisioned pursuing the responsible redevelopment of its underutilized lands in line with its corporate values as community stewards; leveraging its real estate assets to expand its business, diversify its visitor base and revenue streams, continue to deliver an unparalleled horseracing experience to the world, and ensure the long-term sustainability of the horseracing industry in Ontario. Woodbine Entertainment is the master developer of the Woodbine Racetrack site. At 684-acres, the site is the single largest contiguously owned, largely undeveloped parcel of land remaining in the City of Toronto – Canada’s largest city and one of the most robust real estate markets in North America. Woodbine will continue to be the ultimate destination for horse racing and gaming, while integrating new expanded entertainment and cultural offerings, food and dining, hotel, shopping, employment, post-secondary education, recreation, health, wellness, and urban residential living. It will be an exhilarating place to live, work, and play all within a walkable community framework – a true next-generation neighbourhood. Woodbine Racetrack is ideally located in northwest Toronto (population approx. 2.6 million) surrounded by the growing municipalities of Yo​rk (population approx. 1.1 million) and Peel (population approx. 1.3 million). A GO Station is coming to Woodbine Racetrack! Please click here to read more. Woodbine Entertainment is also the master developer of the Woodbine, Mohawk Park site. The company previously announced more than more than $10 million in upgrades which will transform the Woodbine, Mohawk Park into a year-round exclusive home dedicated to Standardbred horse racing. Construction began in the fall of 2017 and was completed in spring of 2018. 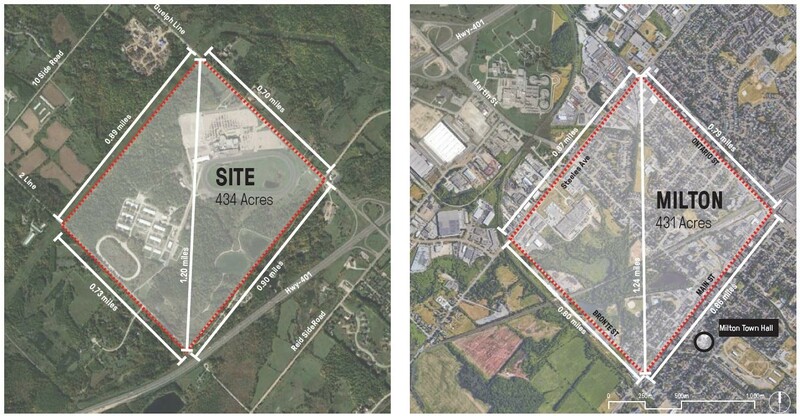 Additionally, Woodbine Entertainment Group has engaged renowned urban designer and landscape architects, SWA Group to develop a master plan for the 434-acre property. The broadened development will include facilities to support expanded entertainment, specialty interactive concepts, family friendly recreation, unique-to-region destination uses including office, retail, integrated green space, as well as hotel, hospitality and diverse dining options. The site is located 64 km from the Toronto City Centre, in the Town of Milton, within the Regional Municipality of Halton. Halton is at the western edge of the Greater Toronto Area and has undergone expansive urban growth within the past decade. Mohawk Park is centralized between the four municipalities of the region including Burlington, Halton Hills, Oakville, and Milton. Surrounded on all sides by large urban centres within a 30-minute drive, Mohawk Park benefits from being “the hole in the donut.” This positioning will create a large and diverse catchment area to draw upon.